It has been a good week for just strolling, by the light of the moon above as Flanagan and Allen might have had it, or otherwise. Some evenings it has been balmy, with foundling leaves swirling and crackling round in low breezes or sticking perilously to the pathways preparing to ambush the inattentive. 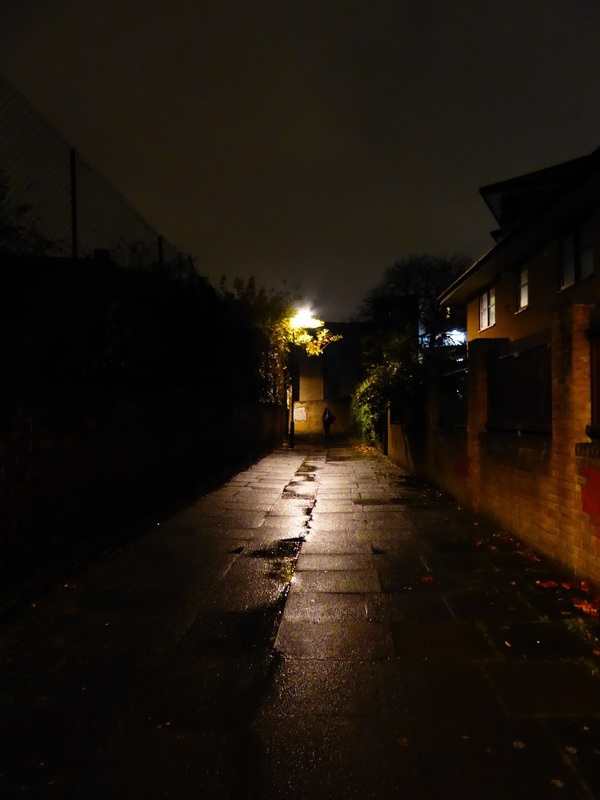 I love the way the low light - along the canal, through the park, down the short-cut side streets - softens the rough surfaces and harsh tones of the city, hiding the unswept gutters and graffiti in the shadows. 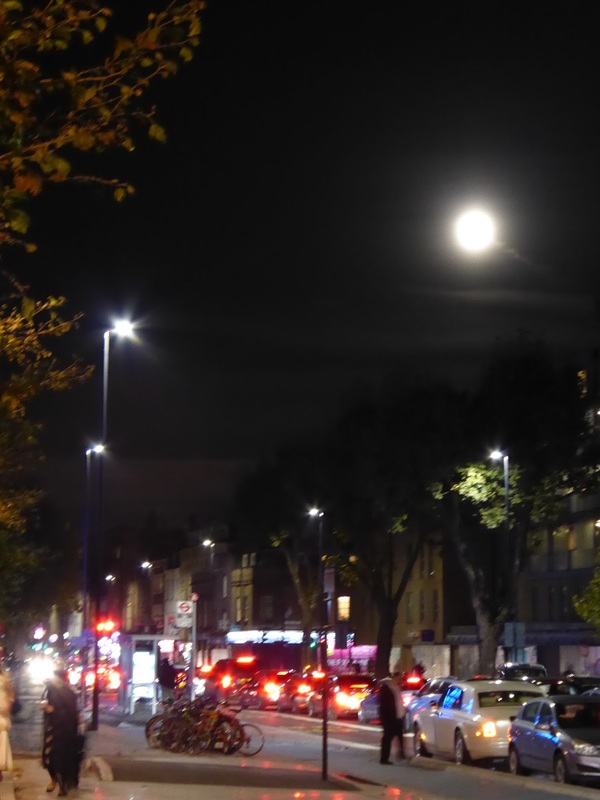 On the main hauls, the hubbub and the dazzle of headlights, street lamps and the Tesco Metro shop windows play other tricks but still can't compete with the beauty of the perigee moon along the Mile End Road. There's something about this walking at night that makes you hyper alert. We may not be in the dark forests of wicked witches, wolves and woodcutters, but, well, you never know. This evening a skein of geese flew overhead making just enough whispering noise to make me look up. Later on I noticed I gave a much wider berth to the Staffie and his owner than to the little lapdog and hers. We all have our prejudices. And preferences: I stick mostly to the places I know and like best. It's easy to forget at this time of year that what might seem late is actually not late at all. Side streets that are quiet during the day are deserted by five o'clock. It may feel like midnight, but turn a few corners and you find the that the last of the market stalls on Whitechapel Road are just stalling in and shoppers are still popping into the Bengali Sweet Shops for something truly suitable only for those whose teeth have been protected for years by fluoride in the water. Occasionally I complete the circuit by bus or train. Those pavements can be hard on the arches. By the time I get home, I'll be rosy cheeked, a little too warm from the chunky sweater under my jacket, ready for a chair by the fire, a chat about where I've been, what I've seen, what I may have brought home with me and, let's be honest here, just a little sanctimonious about the number of steps I've clocked up. If you are interested in London walking and it comes your way, go and see the slightly whacky, funny, sad and enraging film London Overground. John Rogers has done a lovely job. Or just watch one of John Rogers' short films about walking. This is a walk John suggested to him. I just love it. I enjoyed my virtual walk around the city. Love love love this post. There's just something about towns and cities after dark that makes night walking my favourite activity (just throw in an autumnal or winter setting and maybe a Boo to complete the picture). It started all those years ago with the long walks home in the dark after nights out with friends, there was no money left for a taxi and the last bus had long since returned to the depot. The town was the same but different, you couldn't see as much but you could hear more, including your own thoughts. Magical. Yes! My school friends all lived out of the way and I had to negotiate some unsalubrious streets to get home. Must be whee I perfected the quick march and scathing aside to brush off unwanted attention. Not st all. I like doing that too, especially at Christmas when you need to walk off the excess and there's a lot of twinkling going on. Not able to do so much walking these days but, as a governor of a school in Lambeth, I really enjoy taking a bus from Liverpool Street to the Imperial War Museum (the school is next door to it) for evening meetings. Crossing the river and seeing all the lights and enjoying the Dickensian street names just south of Southwark bridge - Marshalsea Road, Little Dorrit's playground and Quilp Street, for example. And the congestion caused by the closure of Tower Bridge means that none of this observation is rushed.